Apple Store Training Manual Leaked, You Too Can Be A Genius! Have you ever noticed that the Geniuses in charge of support at Apple Stores always seem know exactly what to say? That’s not a coincidence. Apple employees are given a hefty training manual, filled to the bindings with psychological training for dealing with frantic customers, phrases they should use or avoid, and scenarios they should practice for. 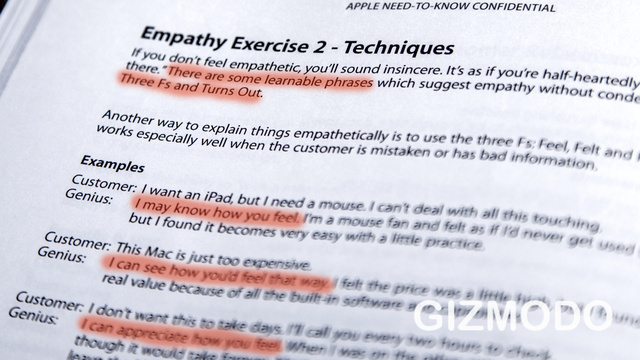 Gizmodo has got their hands on a physical copy of Apple’s internal Genius Training Student Workbook, and they posted some excerpts/examples online. The fine art of correcting a customer without insulting them. My favorite trick in Apple’s book is the ‘three F’s, which is spot on advice if you’ve ever had to deal with frantic customers on behalf of a corporation. The three Fs stand for feel, felt, and found. They take a complaint, subjectively validate it, and then show a transition between their previous agreement and a presented ‘objective’ company line. An example of the Three Fs the text is as follows. Customer: I want an iPad, but I need a mouse. I can’t deal with all this touching. Genius: I may know how you feel. I’m a mouse fan and felt as if I’d never get used to it but I found it becomes very easy with a little practice. Mouse support isn’t available in iOS by default, but can be added through Cydia tweaks like Mouse Support, Veency, and BTstack Mouse. It goes without saying that Apple employees won’t suggest these unapproved workarounds. The error which must not be named! There’s another reason why I wouldn’t be able to say the previous paragraph if I were an Apple employees. Certain words are off limits. Geniuses are instructed to avoid negative words like crash, hang, problem, supported, or incompatible. Instead I would have to say that the iPad doesn’t ‘work with’ a mouse. And if the iPad shuts down during a task, it would be a case of the app “crashing”; instead it “unexpectedly quit.” The idea is not to blame the hardware or software, and instead isolate the specific “situation” that needs to be resolved. It’s a clever use of tech support as marketing. That said, not everything in the manual works well. 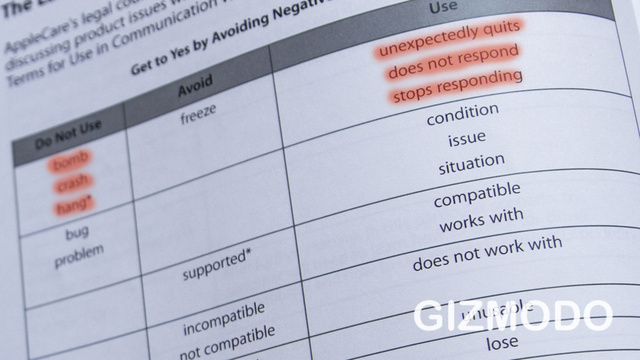 The manual Gizmodo received contains a section on providing feedback to other employees, when in practice it’s generally not received well. Now that the secret’s out, how long do you think it will be before Samsung employees start using “Feel, Felt, Found” along with colorful euphemisms for a system crash? :D Share your guess in the comments section below.